FishPal site has a synopsis about each fishery, including river levels, fishing reports, latest catches and most beats have catch statistics for the last 5 years. 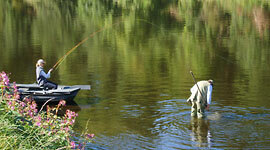 Information about how to get to the fishery, where to stay, tackle advice and much more. Our customer services team is on hand Monday to Friday 9am to 5pm to help with any queries or make a reservation for you.